Recently, the first batch of CNG gas passenger cars in Shandong Luzhou officially launched their operations at the bus station. 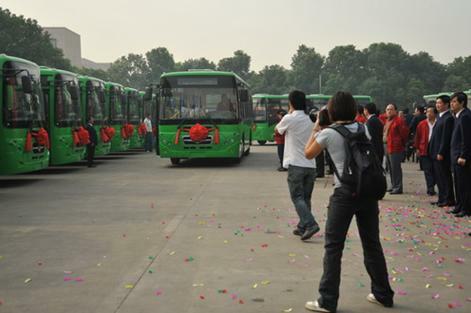 The first batch of gas buses totaled 4 vehicles, all of which were put into the Qingxian-Beijing class line. This is the first time that environmental protection and energy-saving buses have been put into road passenger transport. CNG gas passenger car is an ultra-low temperature frozen liquid natural gas, which has the characteristics of large calorific value, high performance and low cost. Compared with traditional gasoline and diesel, CNG vehicle exhaust gas harmful substances can be reduced by more than 90%, close to Zero emission is an internationally recognized "green" new energy source that can replace gasoline and diesel. Since the engine noise of the car is half as low as that of gasoline and diesel, the combustion in the engine is stable, and passengers will feel more comfortable while riding. This model meets the needs of social development and greatly increases energy consumption costs. CNG (compressed natural gas), as a gaseous fuel, is more evenly mixed with air, more fully burned, and emits less harmful substances such as CO and HC; there is no carbon deposition after natural gas combustion, engine wear can be reduced, and maintenance and repair costs are low; The engine conversion is simple, the fuel cost of natural gas buses is much lower than that of diesel or gasoline engines, and the economic benefits are very high. Moreover, it is comfortable and has a low noise, which greatly optimizes the passenger environment.